Visit Dave Anderson's site for two Tiltall based innovations. Dave has recently (August 2010) blogged about his adventures with the Tiltall and the headless monocolumn. Continuing his demonstration of what a innovative mind and a friendly machinist can create. I am happy to post links to all other useful objects d' Tiltall. I encourage Tiltall owners and designers to engage each other directly as my plate is overfull. My own tinkering with Tiltall parts and pieces to create a video stablizer - any thoughts would be appreciated. Click on photo to enlarge. Hopefully, this idea would not only smooth the tiny new HD cameras, but the offerings of the Nikon and Canon still/motion convergence as well. design on my own Tiltalls: Left: Early model Leitz Tiltall tripod. (best-working; all brass, similar to Marchioni); Middle: Late model Leitz Tiltall monopod. 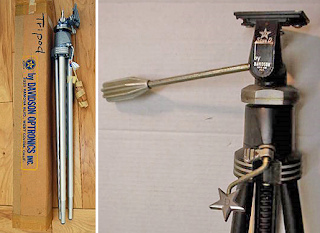 (better-working; brass and plastic); Right: Star-D Tiltall tripod. (cheaply designed; soft nylon. 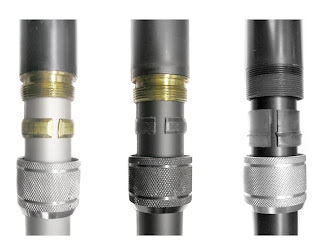 Aluminum locking collar threaded onto an aluminum tube - a metallurgical no-no. Note that the nylon bushing has formed a small ridge as a result of repeated jams).